We were not treated to many goals this World Cup. But from the few -- there were just 145, the lowest in any FIFA World Cup since the tournament switched to a 64-game format -- the ones that stood out found a place in our ten best of the tournament. 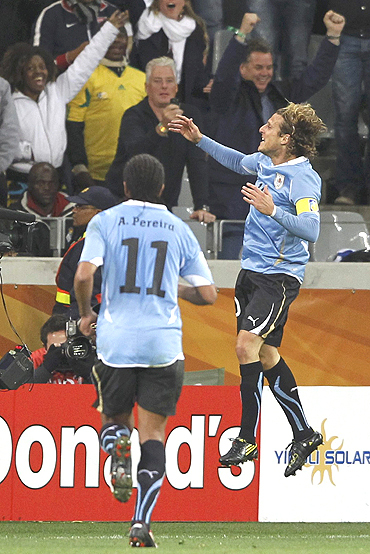 The opening goal of the 2010 Football World Cup takes pride of place in our list. There couldn't have been a better goal scored to decorate the opening match. Siphiwe Tshabalala's thunderbolt strike against the Mexicans in the opening game got the world talking. In the 55th minute of play, in a hugely entertaining match, the Kaizer Chiefs' midfielder, who was playing in his 50th international, crashed home an unstoppable left foot shot high and wide of Mexican goalkeeper Oscar Perez after a wonderful pass from Kagisho Dikgacoi. That was just the start of things to follow at the football extravaganza in South Africa. It was one of the most thrilling games of the World Cup. Audiences couldn't have had a better exhibition of football in the first semi-final. It was Dutch skipper Giovanni Van Bronchorst who turned it on. He must have not struck a goal as good in his career. His 35-metre scorcher flew past Uruguayan keeper Fernando Muslera from wide on the left. It gave the Dutch an 18th-minute lead. That goal helped them put one leg into their third World Cup final. If you can do it, I can do it better: That is probably what Uruguayan captain Diego Forlan must have said to himself before sending a perfect pile driver past Dutch keeper Maarten Stekelenburg to match the goal struck by his Dutch counterpart. Forlan took the ball from midfield, moved it to his left and sent in a scorcher from 30 yards. The ball swerved ridiculously before fizzing into the net past the wrong-footed Stekelenburg. It was an all-South American affair as Mexico took on a sprightly Argentina in their Round of 16 clash. It was billed to be an entertainer but controversy was king on the day. And the man in the centre of the storm was Carlos Tevez. 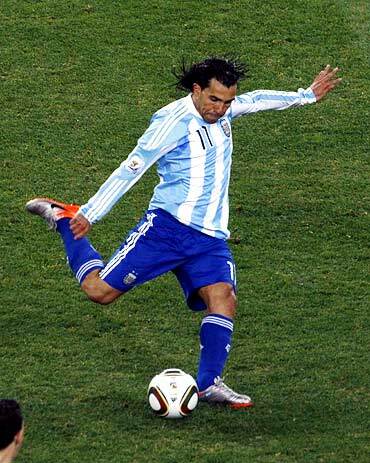 Tevez had put Argentina in the lead through a controversial goal early in the first half. He was off-side when he struck past goalkeeper Oscar Perez. But the real deal came seven minutes into the second half. Tevez took possession and controlled the ball 25 yards from the box before releasing a right-footed thunderbolt that crashed into the top corner of goalkeeper Perez's net. After a beauty of a goal like that, it's possible that the Mexicans would have forgiven Tevez for cheating them in the first half. Brazil were strangulated by North Korea in the first 45 minutes of their opening Group G encounter. The five-time champions were given no space to manoeuvre and the Koreans looked sharp. It looked like we were in for a draw. But the tide changed in the second session. Brazil looked more purposeful and it was Maicon magic that helped them edge the Koreans. A moment of brilliance from Maicon saved Brazil the blushes. The full back latched on to Elano's pass and somehow blasted his shot into the net from the acutest of angles in the 55th minute. Elano slid the ball into the path of Maicon, who managed to find the gap between the keeper and the near post from almost on the touchline. As the world watched in awe, Maicon shed a few tears in celebration. Uruguay was definitely the most underrated side of the tournament. But it was Luis Suarez who made people sit up and take notice of the talented squad that received very little attention going into the tournament. Sanchez brought the focus on Uruguay and himself when he scored an 80th minute winner against South Korea. Edinson Cavani neatly curled the ball out wide to Diego Forlan, whose low cross cut through the sleeping Korean defence to the unmarked Suarez, who side-footed into an empty net. Amidst heavy rain, his shot came like a rainbow like arc before beating the napping Korean defence. David Villa was the man to watch out for in the tournament and he showed why he was so highly billed. He struck twice in the game against Honduras to give the Spaniards a 2-0 win. His first of the match was a awe-inspiring one. In the 17th minute, he picked the ball on the left, cut between two opponents, turned inside another and lifted a shot into the top corner past Honduras goalkeeper Noel Valladares. Luis Fabiano gained notoriety for his double handball in the match against Ivory Coast. But few remember the beauty he scored in the same match just 25 minutes earlier. An otherwise poor first half only came to life when Fabiano despatched the ball high into the roof of the net past goalkeeper Boubacar Barry. A smart backheel and a fortunate one-two with Kaka led to the goal. Not many may remember this Arne Friedrich goal, as it was Thomas Mueller's double that helped Germany eclipse Argentina in the quarter-finals. But it was the goal of the day, perfectly set up by Bastian Schweinsteiger. The midfielder burst away from three opponents to bring the ball in and lap the crispiest of passes to Friedrich, who tapped in with utmost calm. The goal merits a place in this list because of its perfect execution. We have included this in the list simply because it was the World Cup-winning goal. 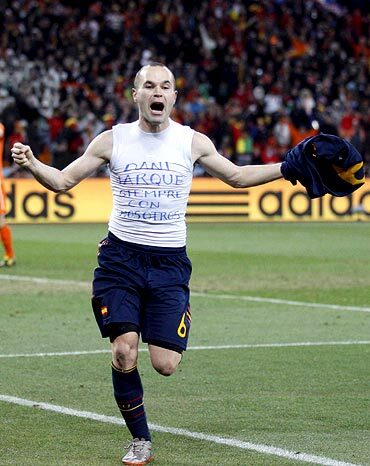 After 118 minutes of play, Iniesta fired home the winner after being put through in the area by Cesc Fabregas. Keeper Maarten Stekelenburg dived to his right and got a touch to the ball but could not keep it out. Spain lifted the World Cup for the first time and completed a rare double Euro and World champions.